Myss Lafunky's Blog: He is Risen! One could have travelled to different places. A business deal could have been sealed. A marriage proposal may have occurred. A wedding may have taken place. You could have been given your special gift or promotion. 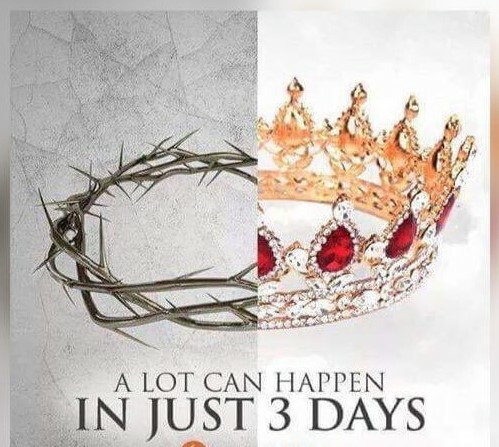 Add three extra days to it, the Lord created the heavens and the earth, the sea and all that is in this world in just 6 days. 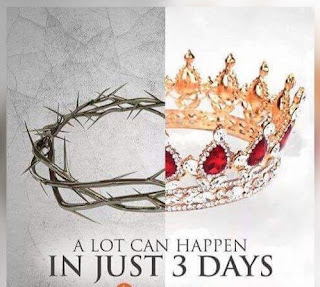 Indeed...a lot can happen in just three days. Something miraculous happened within three days. Something that assures you and I of heaven. Something that wiped off all our sins. Something that is always ready to help you to live a fun and pleasing life on this earth and thereafter. Jesus Christ died for our sins. He was buried, and He was raised from the dead on the third day. Third day! WOW! He is the ONLY God to have died and risen. No account of any other god that had died and risen exists. After Jesus Christ had died and risen, He was seen by Peter, the twelve apostles and more than 500 followers. Jesus wants you and I to have a relationship with Him. Thus, He has allowed the same POWER that raised Him from the dead to live inside us. This power is called the Holy Spirit. The Holy Spirit helps us to understand God, comforts us, directs us and teaches us among other things. Thank you Jesus Christ for your death and for your resurrection. The ONLY GOD to conquer death. Happy Easter to everyone. Remember the reason for the season. The Easter egg symbolises a new life; it symbolises Jesus' emergence from the tomb and resurrection.